The overlock stitch is a specialized stitch on the sewing machine for giving seams a finished look that keeps the fabric from unraveling. The overlock stitch is a combination of a straight stitch and a zigzag. It sews backward and forward in a straight line, but between every set of straight stitches, it sews a zigzag. When I learned how to make clothing, my grandmother taught me to always use pinking shears that cut the edge of the fabric in a zig-zag pattern. This was to keep the fabric from unraveling. I hated to use those shears, they were hard to use and hurt my hand. At the time my grandmother had only a straight stitch sewing machine. Now, I use the overlock stitch whenever I make clothing. The overlock stitch mimics a serger which trims and overlocks in one step. 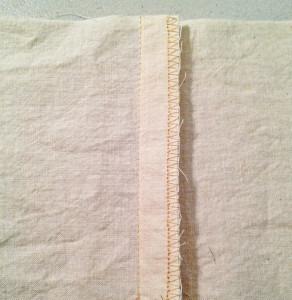 The beauty of having this stitch on a regular sewing machine is that you only need one machine to accomplish both jobs.